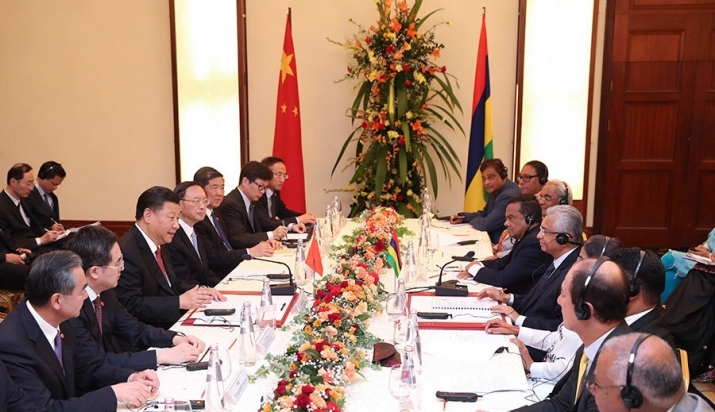 Chinese President Xi Jinping said here on July 28 that China is willing to always be a good friend and a good partner of Mauritius and promote the bilateral friendly cooperative ties to continuously reach new heights. 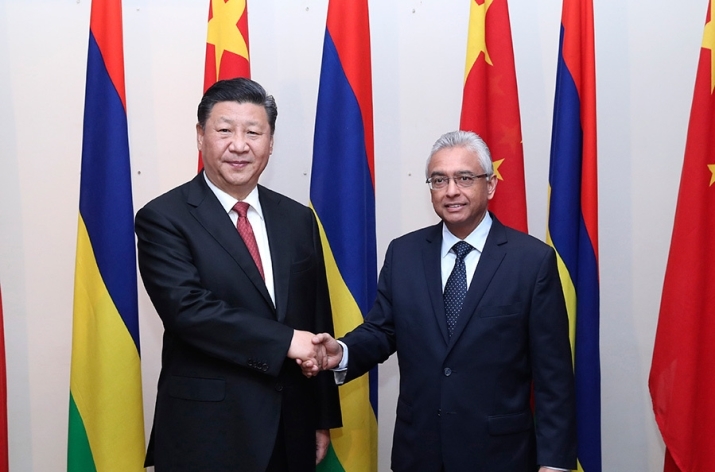 Xi made the remarks when meeting with Mauritian Prime Minister Pravind Jugnauth during his friendly visit to the country. Xi spoke positively about the remarkable achievements Mauritius has made since it gained independence 50 years ago, and expressed appreciation for the friendly policy the successive Mauritian governments have followed toward China. He pointed out that the two countries and two peoples enjoy profound friendship and cherish a close bond of affection for each other. Since China and Mauritius established diplomatic ties 46 years ago, the two sides have witnessed increasingly deepened political mutual trust and fruitful results in exchanges and cooperation in various areas, Xi said. Both as developing countries, China and Mauritius have similar development processes and tasks, he said. The two countries now face new important opportunities for the development of their relations, Xi pointed out. The Chinese president said that the two countries should maintain the momentum of high-level exchanges, strengthen exchanges between government departments, legislative bodies and at sub-national level, and continue to understand and support each other on issues involving respective core interests and major concern. The two sides should explore the potential for practical cooperation, improve the standard of bilateral trade and investment liberalization and facilitation, negotiate about and sign a bilateral free trade agreement at an early date, leverage the unique geographical advantage of Mauritius in participating in the Belt and Road Initiative, strengthen communication and aligning, and deepen cooperation in a wide range of areas, Xi said. The two countries should also enhance people-to-people exchanges and mutual understanding, he said. China stands ready to strengthen South-South cooperation on climate change with Mauritius, increase coordination in international affairs and safeguard the common interests of developing countries, he said. On China-Africa relations, Xi said that China and Africa are a community with a shared future in which the two sides go through thick and thin together, and are also a community of shared interests in which the two sides carry out win-win cooperation. No matter how the international landscape changes, and no matter how much progress China has made in development, China will always stand together with Africa and other developing countries, and will be a sincere friend and reliable partner of Africa forever, Xi said. He said that China and Africa have decided to hold the Beijing Summit of the Forum on China-Africa Cooperation (FOCAC) in September, and he looks forward to discussing the China-Africa cooperation plan in the new era with African leaders including Prime Minister Jugnauth. Jugnauth again extended his warm welcome for President Xi's stopover in and historic friendly visit to Mauritius, saying that the two countries enjoy a long history of friendship based on historical inheritance and people-to-people bond. He said that since the two countries established diplomatic ties, the two sides have developed a close and vigorous relationship on the basis of mutual trust and mutual respect. Mauritius thanks China for its long-term strong support and assistance, pays high attention to China's development in the new era, admires China's tremendous achievements, and speaks positively of President Xi's proposal to build a community with a shared future for mankind, he said. Mauritius will continue to firmly uphold the one China policy, welcomes the Belt and Road Initiative, and is willing to deepen mutually beneficial and friendly cooperation with China, Jugnauth said. The prime minister said that he eagerly looks forward to attending the FOCAC Beijing Summit to jointly build an even closer Africa-China partnership. Mauritius is the last stop of Xi's five-nation Middle East and Africa tour. He has visited the United Arab Emirates, Senegal, Rwanda and South Africa, and attended the 10th BRICS summit in Johannesburg.